MINNEAPOLIS, MN (US), September 2018 — Engineers and medical researchers at the University of Minnesota have teamed up to create a groundbreaking 3D-printed device that could someday help patients with long-term spinal cord injuries regain some function. “This is the first time anyone has been able to directly 3D print neuronal stem cells derived from adult human cells on a 3D-printed guide and have the cells differentiate into active nerve cells in the lab,” said Michael McAlpine, Ph.D., a co-author of the study and professor of mechanical engineering. University of Minnesota researchers developed a prototype of a 3D-printed device with living cells that could help spinal cord patients restore some function. 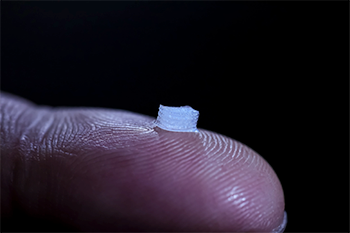 The size of the device could be custom-printed to fit each patient’s spinal cord. The patient’s own cells would be printed on the guide to avoid rejection in the body. Image courtesy of the University of Minnesota.